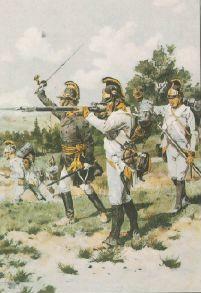 Print by Ottenfeld showing German fusiliers in the 1798-1809 uniform. Although the helmet was officially replaced with a shako in 1806, many German regiments retained their helmets until Wagram (1809). Note - German troops wore white breeches and black gaiters. Austrian Line Infantry Regts were termed either "German" or "Hungarian" depending on where the Regt drew its recruits from. Nominal strength of each coy was 4 officers and 230 men. However on campaign, the average coy was about 150 men strong - giving a battalion strength of around 900 men. Hungarian Regts were organised along the same lines as the German Regts. However, Hungarian Regts had 3 field battalions. In 1805, just before the Austerlitz campaign, hasty reforms were pushed through. Nominal coy strength was reduced to 160 men. Each coy probably averaged 100-120 men on campaign - giving a battalion strength of around 400-500 men. However, it is uncertain if many Regts actually implemented the new regulations. There is evidence to show that Archduke Charles did not apply the new regulations as it was likely to cause confusion - coming into force just before a major campaign. In 1807, these regulations were abolished and Regimental organisation reverted to the previous organisation. After the defeat at Wagram, 1809, loss of recruiting grounds resulted in the disbanding of the 13th, 23rd, 38th,43rd, 45th, 46th, 50th and 55th Regts. All 3rd battalions were reduced to cadres, and coy strength was reduced to 60 men in German regts, and 100 men in Hungarian ones. Close-up of braid on Hungarian pants. Note also the pointed cuff (Funcken). 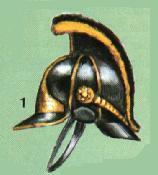 From 1798-1806, fusiliers wore a distinctive helmet (see title graphic). Although the helmet was officially replaced by a double peaked shako in 1806, most German regts retained their helmets until the defeat at Wagram in 1809. Grenadiers wore a bearskin hat. Because of its distinct shape, it was nicknamed fauteuil or "armchair" by the French. 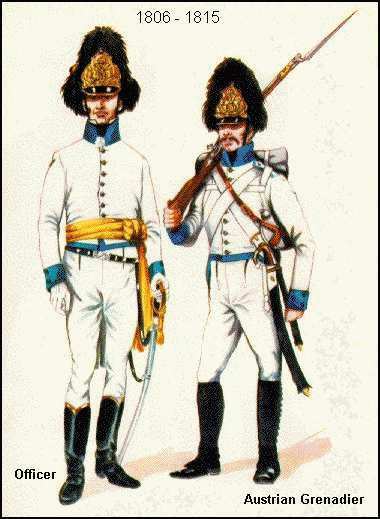 German troops wore white breeches. Black gaiters extended to just below the knee. 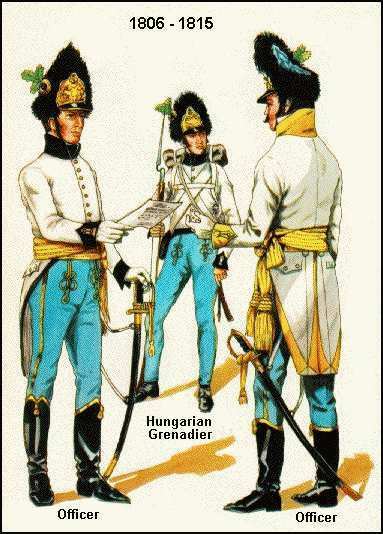 Hungarian troops wore light or middle blue breeches with a decorated with yellow and black braided loops at the top of the thigh, and running down the seams. The breeches were tucked into ankle boots (no gaiters). Hungarian infantry coats were virtually identical to the German ones - except that the Hungarians had pointed cuffs. Click here for a list of Austrian infantry regts and facing colours. Liliane and Fred Funcken - Historische Uniformen. Illustrations from Funcken reproduced with kind permission of the authors. 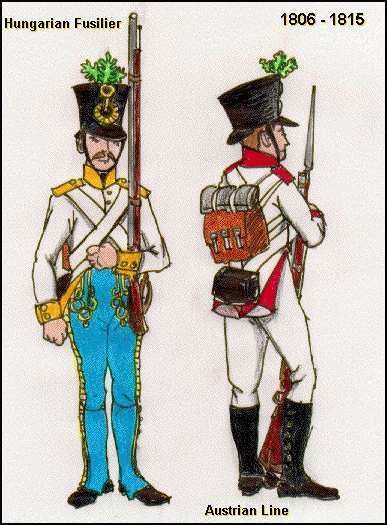 Austrian Hungarian Fusilier, 1806 (L) and Austrian German Fusilier, post 1809 (R).